I just watched the Collision DVD for a second time, and once again thoroughly enjoyed it. It is very intellectually stimulating, representing quite fairly the views from both sides as they discuss the question, “Is Christianity Good for The World?” a question so important, it simply cannot be overlooked by any thinking person. The filming techniques employed in this documentary-type production are not only interesting, and (for me) novel, but also artistic. The music is often hip-hoppy while Christopher Hitchens and Douglas Wilson are portrayed as movie/music stars, which is so antithetical to the impression you would come away with having read or seen either of them, that you cant help cracking a smile. Definitely worth a watch if you can get your hands on it. 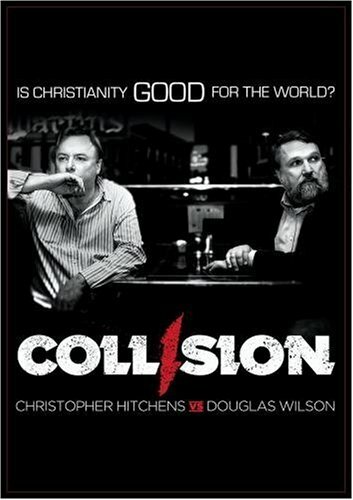 There is also a book written by Hitchens and Wilson called, “Is Christianity Good for the World?” which I have not yet read, but can imagine explores each of their arguments in more detail.